Seacscape Suite Additional add-on to the seascape house only. Large studio cottage is the perfect addition for extra guests or privacy. Queen bed has since been replaced and newer bedding and linens adorning beach theme have been acquired. 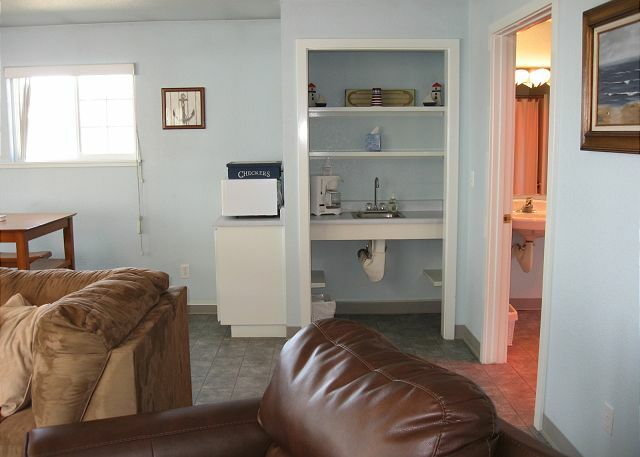 While there is no food preparation area, there is a small sink and microwave available. This suite is only available as an additional add on the Seascape House only. It cannot be rented alone. We enjoyed our stay there and found the location to be convenient for our activities, kayaking and beach combing. However 2 of our party stayed in the suite and found the mattresses to be very uncomfortable, lumpy and they could feel the springs. Also the barbecue was not clean and hard to maintain a decent grilling temperature. However we are looking forward to returning again next summer. Thank you for the feedback. The BBQ has since been replaced and your feedback regarding the bed has been forwarded on to the homeowner. Thank you for that feedback. We are glad to hear that you otherwise enjoyed the home and will be returning to stay with us. We look forward to accommodating you again. Glad the suite was accommodating and worked out well for you. Thank you for your stay. Thank you for choosing the Seascape and suite. We hope you enjoyed your time at this wonderful, unique location above the harbor. Thank you for staying with us and for choosing the Seascape House and Suite. Magical!!! Spectacular Views & Incredible Home!!! We had a wonderful experience staying at SeaScape in Trinidad. The check in was super easy. The staff very responsive & you can't beat this location!!! Located just above the pier we were able to walk to the restaurant & also walk to go fishing on the Jumpin Jack. We will be back!!! My family and I, along with 2 other couples, took up residence in the Seascape Properties for a couple of nights. We were not disappointed. Everything was spot on, and we had a great time on the coast. We highly recommend this rental and will be back in other seasons to enjoy the Humboldt coast at its finest. Thank you for staying at the Seascape House and Seascape Suite. What a great location to stay in, especially for a yearly fishing and crab trip. I hope you were able to get out every day and enjoy plentiful seafood. Redwood Coast Vacation Rentals thanks you for your recent booking and I hope we will see you again next year! We enjoyed our spring vacation at seascape. This was our second stay here and it never disappoints! The house was clean and well stocked and had enough space for everyone. The location is perfect as the house is perched above the restaurant and between the pier and Trinidad beach. Great for fishing!!! They were very accommodating and sensitive to the needs of my disabled daughter. We will be back!! Thank you for returning to the Seascape Home and Suite. This house is always such a treat due to the unique location and I am pleased we were able to help accommodate you in any way. Hope we will get to see you again in the future. The house overlooks the beach and harbor, and is at the trailhead for the Trinidad Head trail. Restaurants and a grocery store are an easy walk. We showed up after several day's travel in the family station wagon, and the last thing my boys wanted was to spend more time in a room together. Happily, there's a guest cottage next to the main house. We hadn't rented it, not thinking we'd need the extra space, but thought better of it when we arrived and called the managers. Even though it was after 8:00 in the evening they were very responsive, and we had the code to access the guest house immediately. The extra room turned our stay in Trinidad into the kind of relaxing experience we so needed at that point in our family vacation. Thank you for the review, Jay. I am glad the addition of the suite worked out for you, at the Seascape House. That house is such a treat right there over looking the Trinidad Pier, I am glad you had a good time. Redwood Coast Vacation Rentals thanks you for your stay, and we hope to see you sometime in the future again. Thank you for your recent stay with Redwood Coast Vacation Rentals and your review of the Seascape House. Please visit us again soon!